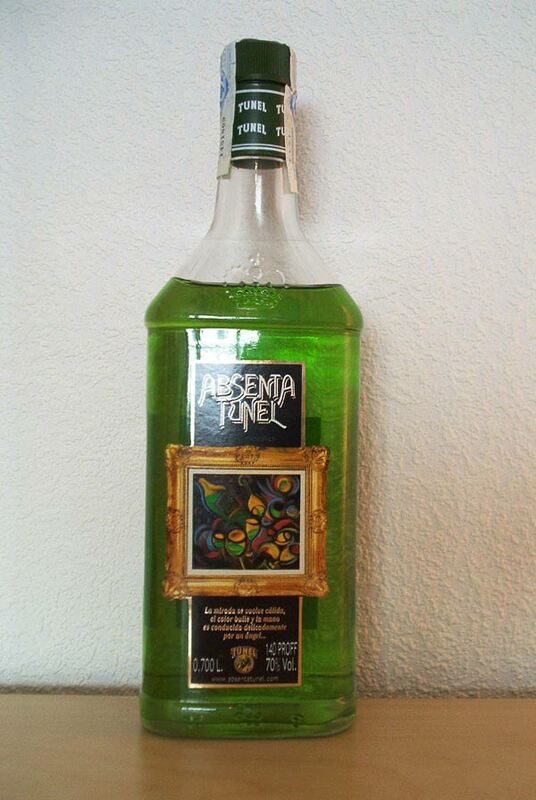 If you ever find rainbow colored absinthes, you can be sure they're from Tunel - regardless of what the label says. It's simply one more oil mix. Once again a very flourescent green absenta. Just like the Mari Mayans. Only this one is not as heavy on the anise. Upon opening the bottle one is immediately hit by a very strong smell of alcohol. There's nothing "herbal" about this one at all, since it is obviously artificially colored and only infused with wormwood oil and star anise. Tasting the Absenta Tunel neat gives no surprises. Very much heat from the alcohol and mostly licorice. Not the taste of fine anise, but licorice. When diluted with water it presents a slight louche, actually a lot less than I had expected, since they use star anise. The taste is a bit more pleasant now, but far from the top quality absinthes. I tried adding a bit more water than I usually do, and by that - the Absenta Tunel actually turns into a very nice "summer cooler". Nothing I'd refer to as a good absinthe, but rather a refreshing cocktail. One funny thing here is a misspelling on the front label. Down in the right hand corner the word "Proof" is neatly spelled "Proff" - now that's quality. All in all I'd say this is not close to what I consider a good absinthe, but nonetheless it's drinkable. Though, given the many better alternatives I doubt the bottle will ever be emptied.